1. Preheat oven to 180 degrees Celsius (360F). 2. Combine all Meatball ingredients in a large bowl and mix well with your hands to combine. 3. Roll tablespoon sized balls and place on a baking dish, evenly spread apart. 4. Bake for 40 minutes, turning half way. 5. Remove from the oven and place on some paper towel. 1. Once the meatballs are in the oven…Heat the oil in a heavy bottomed pan. Add the onion and gently fry until translucent. 2. Add the Bacon and Mushrooms and fry until cooked. 3. When Onion, Bacon and Mushrooms are cooked, add the tins of Tomatoes, Beef Stock, Pepper and Basil. Bring to a simmer and slowly cook until meatballs are ready. 4. 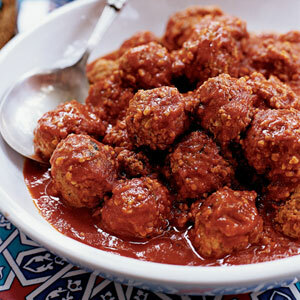 Add Meatballs to the Tomato Sauce and allow to cook over a low heat for a little while longer until sauce reduces. This is not an exact science, it just depends on how it looks in your kitchen. 5. Serve with some fresh basil.